The Weekly Photo Challenge focuses on the different angles the same subject can be seen and photographed. 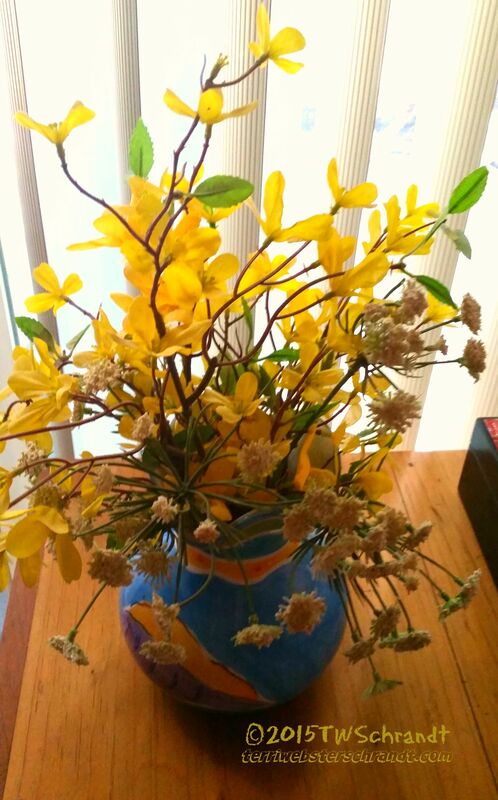 During the summer, I keep vase of yellow silk flowers near a window. I love how the subdued morning light captures the yellow. The next three photos are the different angles I photographed. I took the vase outside and let the morning sunlight perform its magic. When I first saw this I couldn’t think how do a post on it. Today I realized a visit to a Wildlife Refuge would look. PS: I needed to learned how do a pingback from my site to save me some time. Warm, vibrant, lively, friendly and beautiful from any angle, just like the photographer. I really like that fun vase! Sunshine! I can see how the colors of the vase are reflected in your blog colors too. Beautiful! I like your attention arrangement. Yellow is a favorite color. I love both the vase and the photo with the shadow. Very nice! Isn’t yellow wonderful! I am glad the photos made you smile! A little rain is good! Thank you, Lia, that one seems to be popular today 🙂 I hope you have a wonderful weekend!! Happy weekend to you too and have a great start to your school year on Monday! Yes! My favourite is the looking up pic too! The shadow is good, I didn’t think of that perspective right off. I think my favorite is the looking up angle with the tree in the background. I love the vase!